hmmmmmmm... still a bit warm to be thinking of snowmen, perhaps, but Carol is this month's hostess of the Sisterhood and she challenged us to make Christmas cards. How fun! I do love Love LOVE Christmas! Hope your holidays are filled with all your favorite treats! Carol, I hope you like my card! Thanks for giving us an awesome theme with which to work! Hugs!!! I colored my image with Starlitz Glitter Gel Pens (found in the school supply aisle) and used notebook paper, a paper clip, and staples on my card. THANK YOU, SIMON SAYS STAMPS!!! 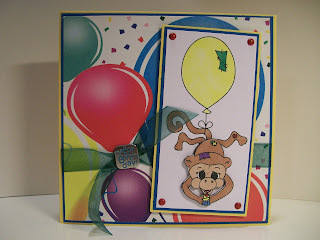 The theme of this week's challenge is BIRTHDAY! I think this is an adorable image; perfect for a birthday card. Miki is holding a yummy cupcake - a birthday cake! To give Miki some dimension, I printed two identical images and layered Miki's head and torso. and don't forget to participate in this week's Sew Many Challenges! 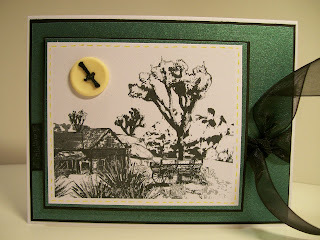 I wanted the image to be the focal point of my card, it is a beautifully detailed scene from years-gone-by. Therefore I sized it pretty large to take up most of the card space. I printed it and left it natural - no coloring. 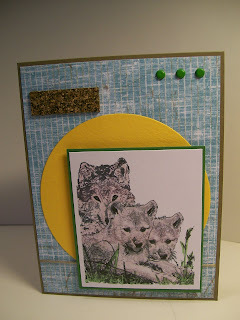 I added a large yellow button to resemble the sun in the sky, which I stitched onto the card. 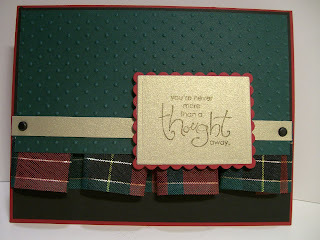 One of the papers I used is a gorgeous green metallic/glittery paper. I also faux stitched around the edge of the image with a yellow glitter gel pen. 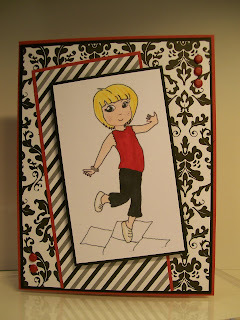 Be sure to join in on the fun with this week's Stamp 'n Doodle Challenge. it's TREASURE HUNT without any vowels. Hmmmm... what to do with those??? Of course! I'll make a travel-theme card! 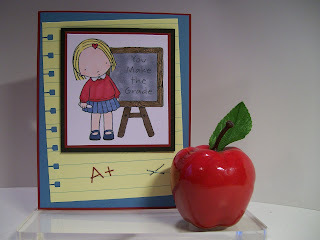 This card will be entered in the Lollipop Crafts Challenge. I hope you enjoyed my Treasure Hunt. 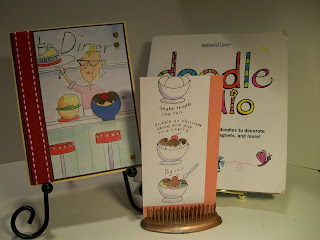 Not too long ago, Heather of Fresh Brewed Designs emailed me (and the other Design Team members) and passed on an invitation to participate in the Lollipop Crafts Challenge that begins today.) Wow! How fun! While my card doesn't fit the challenge - I didn't realize there needed to be a button on the creation, I had a lot of fun! 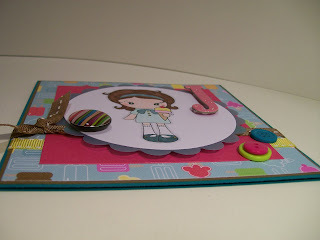 I hope you'll take the Lollipop Crafts Challenge this week! 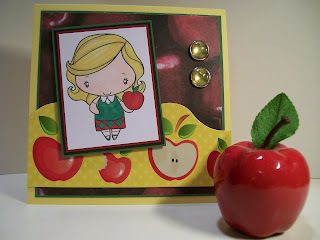 My card is all about Apples! I had a thought yesterday! It actually began when I was blurfing. 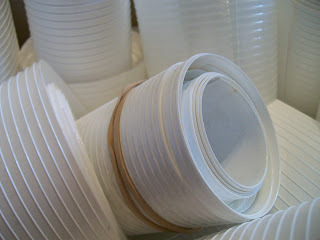 Really Reasonable Ribbon Ramblings is one of my Check This Out blogs.... I have to see what creativity is going on there. Well, check this out! I just loved Susan's ruffled ribbon, and her tutorial looked easy enough, so I thought I'd give it a try. It won't be my last! This was so much fun - and easy! I will definitely be ruffling ribbon again! 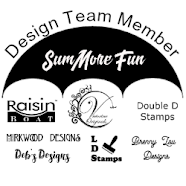 By the way, in case you haven't noticed, Stampin' UP! Cherry Cobbler is quickly becoming one of my MOST favorite colors! Hi Everyone, my name is Stitchy and I create under the name Stitchy Stamps...I have been creating digital images for designers for almost a year now and try to learn something new everyday...I started out in paint shop pro about 8 years ago and started making digital scrap kits...then I was introduced to the wonderful world of paper crafts and card designing...like I said, learning new everyday, the rest is history...I can't draw enough to keep me satisfied anymore lol...Living in a small town in upstate New York, tucked away where cable doesn't even go...friends are far and few between...But being on the internet for the past 10 years, I have gathered quite a few from around the world...Just like I learn something new everyday, I also try to meet someone new every day too...Thank you Angela and Company for allowing me to sponsor for you...I am truly honored. 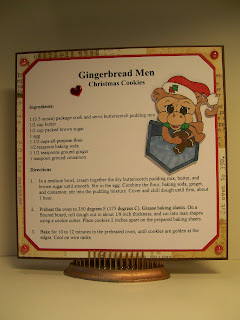 For my Christmas project, I decided to make a recipe layout. 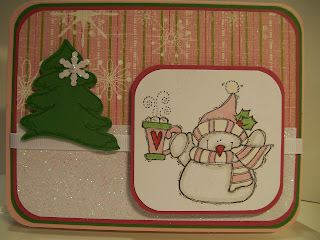 I used the Sew Many Cards Miki Christmas Pocket image on my layout. 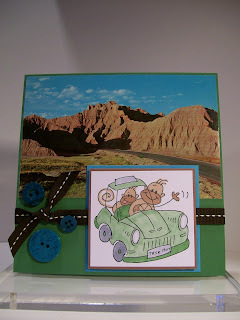 I also had the honor of creating a card using a Stitchy Stamps image of my choice. Stitch gifted me with the Splash image. She is so cute, playing in the rain puddles. Okay, now it's your turn.... turn on some Christmas music and start creating your own Christmas project for this week's Sew Many Challenges. 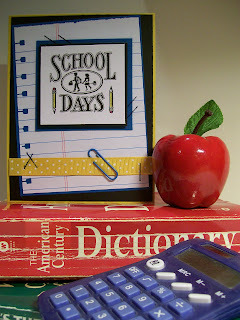 What are your favorite School Colors? 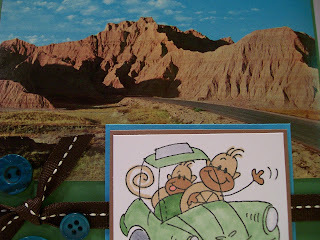 That's the special element in this week's Stamp 'n Doodle Challenge. I decided to use the colors of my own alma mater - Sherwood High School. Whoooooo Knows What That Stuff Is? I find some awesome things! Sometimes I have NO CLUE what some of the things are. But WHAT is that stuff??? 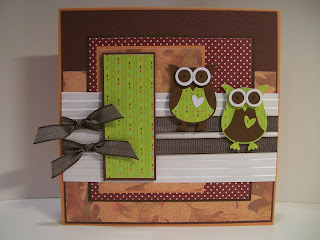 I used my new Stampin' UP! Owl punch...isn't it cute? This has been a HOOT! I have a new stamp set! I bought it so I could make a card for someone special. 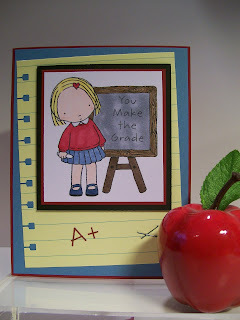 It's funny... when most people see this cute MFT Pure Innocence Make the Grade stamp set, they think of students. I think of my favorite teacher. 1.) My favorite teacher is now an experienced teacher - this is her second year. 2.) While she's never been my teacher in a classroom, I've learned many things from my favorite teacher. 3.) 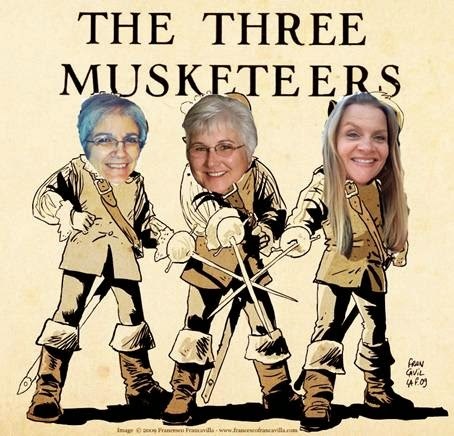 My favorite teacher is creative, fun, and has a serious side, too. 4.) My favorite teacher is not afraid to try new things; to step out of her comfort zone. 5.) My favorite teacher is pretty and kind, too. 6.) My favorite teacher has had multiple articles published. She's an excellent writer. 7.) Never having had a four-legged pet, my favorite teacher longs to own a dog. 8.) My favorite teacher loves to drive around, camp, shop, and chat with friends. 9.) My favorite teacher makes her own sushi. She's a developing cook and does a great job! 10.) I've known my favorite teacher all of her life... she's also my FAVORITE DAUGHTER! She definitely MAKES THE GRADE in my book! Hugs and prayers as you embark on this second year of teaching!!! Today is an exciting day in blogland!!! I have been anticipating this day for several weeks now and have tried not to let the cat out of the bag. That being said, you may have noticed a badge in my right-side column... it's been there for a few weeks. It says I am a Dueling Darling. Hmmmmmm... wonder what that means? Actually, there are 14 Dueling Darlings. We are a bunch of friends from Splitcoast Stampers, mostly friends from the forest swaps that I host. We have formed two teams, the Divas and the Dazzlers and to have fun dueling it out once a month. This month the hosts of the two groups are Kelly (Divas) and myself (Dazzlers). That means we sent kits to the others in our group - identical kits - with the common theme of I Scream, You Scream, We all Scream for Ice Cream. 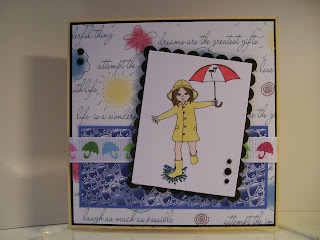 Today is the day each Dueling Darling reveals her creation made with the kit she received. 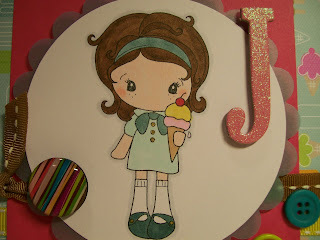 The Dazzlers received kits with the CC Designs Sweet Ki Ki La Rue image, a piece of Doodle Design Inc. You Scream Ice Cream designer paper, a piece of Colorbok Vellum, two pieces of Dashes, Dots, and Checks ribbon, some Paper Studio buttons, and a fancy paper clip. Just for fun, I also sent each Dazzler a K & Co. Glitter Chipboard Letter (her own initial). Dueling Darlings are asked to create a card (or project) with the kit items. 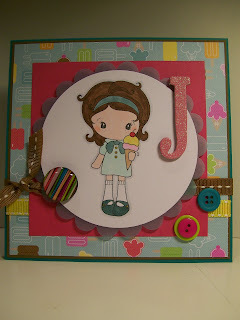 The idea is to see what different crafters create with the same products. Of course, no one must use everything in the kit. 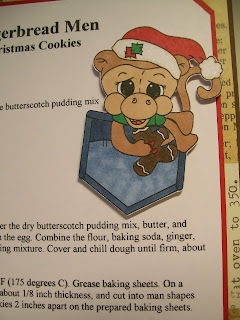 Also, they are free to use their own cardstock and other things as needed to complete their project. I used everything in the kit. LOL! Kind of an over-achiever here, aren't I? The striped circle on the left side is actually the fancy paper clip that was in the kit. I removed the paper clip and used just the striped circle on my card. Pretty easy to do. Now, if you're like me, I'm just as excited as I can be to find out what the other Dazzlers did with the same kit.... let's go see! As I mentioned earlier, the Dueling Darlings are made up of two groups. The other Group - the Divas - also created with the I Scream for Ice Cream theme, but I have no idea what was in the kits Kelly put together for them. Let's go check that out, too! 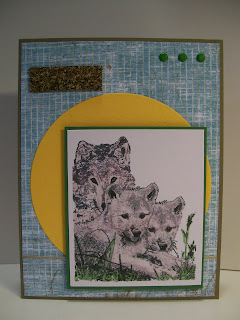 I hope you've had fun with the Dueling Darlings in this first round of monthly creativity! Now, let's all go get some ice cream! 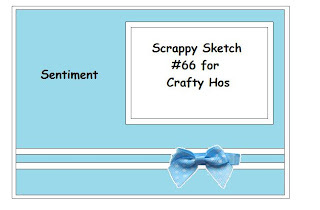 a Crafty Ho SKETCH Challenge! 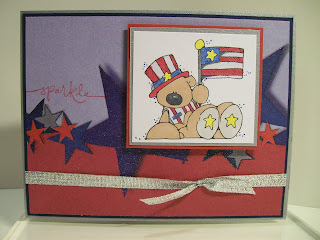 I used a the Patriotic Bear stamp from Whipper Snapper for my card. 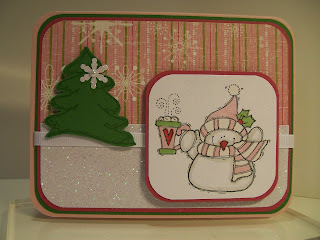 I paired it with some amazing designer paper that had a border of red with stars in a bold row. For embellishment, I used a piece of metallic silver ribbon. Instead, I was gifted with a few images. I had the perfect designer paper to go with it - in my scrap file, of course. So I started playing. And I didn't pop a single balloon in the process. 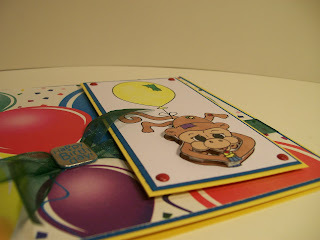 Oh, and in case you're wondering... inside the card I stamped the sentiment "Happy Birthday." 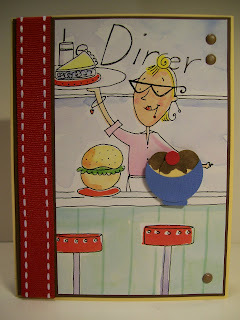 I am thrilled to be part of the Sew Many Cards design team again. After a short break (did you notice SMC hasn't had a challenge the past few weeks? ), things are getting started again. How fun! Let's see some stitching on your project - real or faux. Hi! 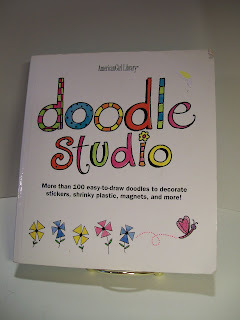 I’m Tiffany Richards, owner of TiffanyDoodles. I’m having the time of my life doing what I was born to do! My background is in Wed Design and Photography. I have been self employed for eight years and have thoroughly enjoyed every minute of my work! Since childhood, I’ve always been creative and taken great pleasure in drawing and painting. 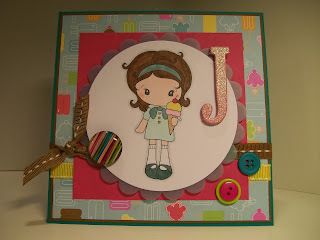 About a year ago, I discovered the stamping and paper crafting world and just fell in love!! In a very short order, I began transforming some of my drawings and doodles into “digis”. It has truly been a joy to share them with folks. 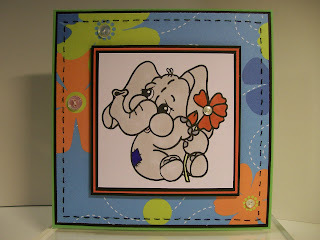 I get so thrilled every time I see something new that someone has created with one of my stamps!! Each design is like a child of mine and it’s really neat to see it all grown up and out in the world being all it can be…LOL! All of my digital stamps are originally created by me and of the multiple styles I offer, most are hand-drawn images. Some are brushed up in Photoshop using the pen tool to produce very clean lines and others are left with a sketchy, rustic, hand-drawn look. An additional digi-style is one that I’ve dubbed as PhotoSketches and these are images from my own photographs which I transformed into sketches with a little help from Photoshop. These beauties make splendid realistic images for stamping! One of the ways that I wish to say “thank you” to all of the folks that followTiffany Doodles is by offering a brand new Freebie every Thursday. I’ve received a hefty response from this which has encouraged me to continue creating even more!! I feel so blessed to have the opportunity to make these daily artsy expressions that others enjoy. 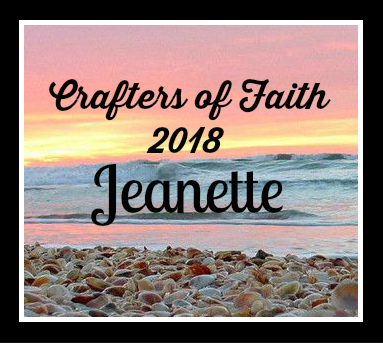 It is a ton of fun to have this creative outlet where I also get to meet other crafty people like myself. 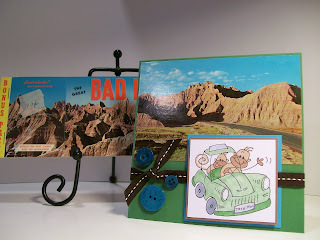 Are you ready for a fun STITCHY Challenge??? I used my Tim Holtz ruler with the awesome row of holes (perfect for piercing) to create the stitching line around the outside perimeter of my designer paper. I then stitched it by hand with black embroidery floss. I also stitched four little buttons to the flower centers. As a special treat, Tiffany gave the SMC design team members an image of our choice with which to create. I selected Owl and Branch. 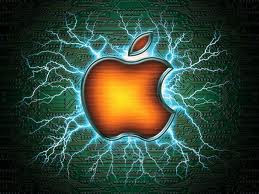 It is an amazing image... actually a set of images. The branch is a separate piece from the owl and there are multiple owls. I colored the images with my Copic markers, then cut them out, leaving a slight white border. 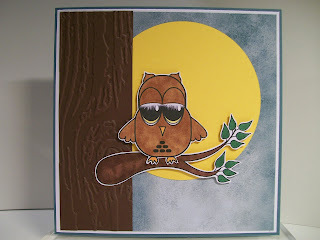 I used a Tim Holtz Woodgrain embossing folder to create the tree trunk. 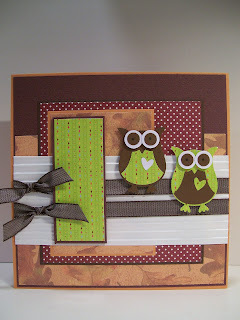 The simplicity of this layout allows the owl and branch to be the focal part of the card. 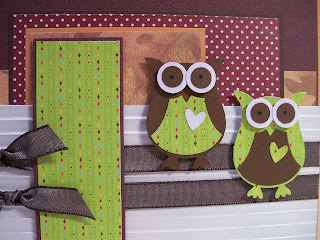 Whooooo should join Sew Many Challenges this week? You will notice that I slightly adapted the sketch (I left our one element). I didn't want to block the top of the circle, since I wanted the circle to represent the rising sun. I used a piece of cork automobile gasket material for the rectangle in the upper left corner. It shows in better detail in the following picture. Three brads were used for the three circles in the upper right corner. A piece of floss is located along the bottom. This is a fun sketch that provides lots of creative license. 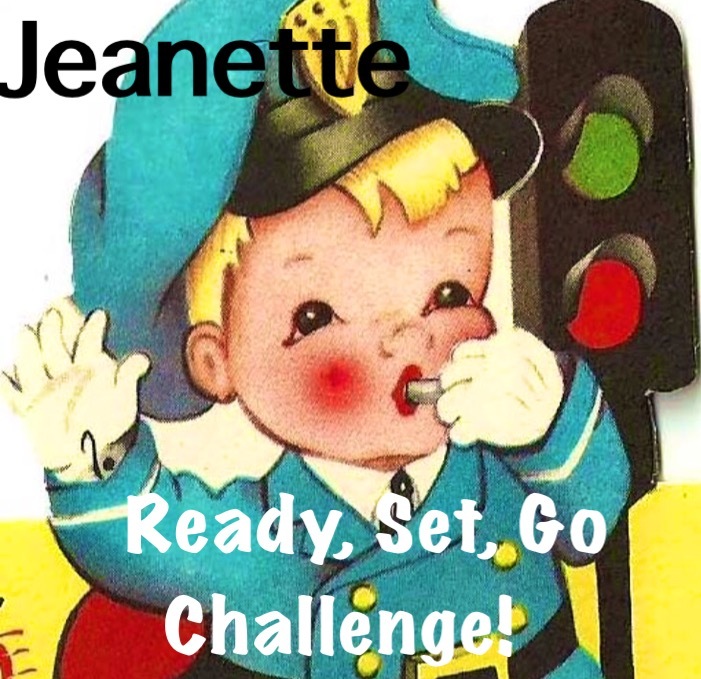 I hope you will take the challenge and create a card of your own. I'd love to see what you come up with. Treasure Hunt Goes to the Local Diner! I love a good ice cream Sundae! Oh, but first, I must tell you about my Treasure Hunt! Woo Hoo!!! What a treasure it is! 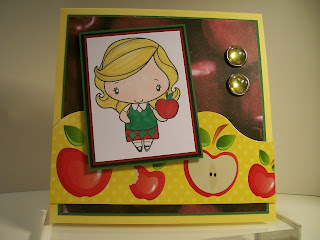 It's filled with lots of creative ideas that can be used in card-making. I had such a difficult time choosing just one thing to use. 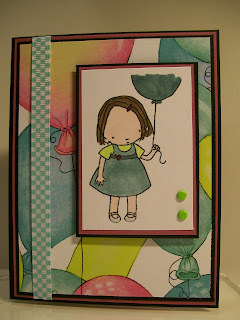 I used part of one of the pages for the designer paper on my card. 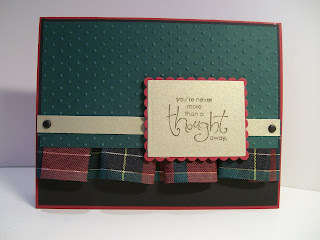 The design area wasn't large enough to fill the entire card, so I filled in the space with a piece of ribbon. I think that worked well! 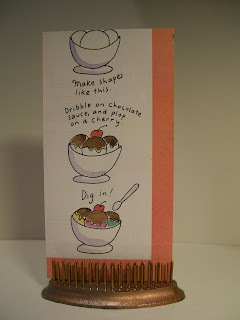 Here's a view of the instructions I adapted to create the Sundae. 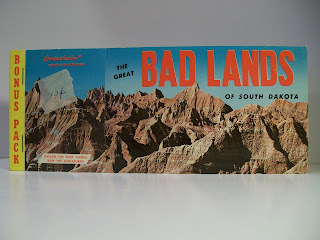 This was a fun Treasure Hunt..... now who will meet me at the local diner for a...... drats! No Sundaes for me (see my profile)... but I'll meet you there anyway and we can chat! How's that sound?